Green and white teas are often used as the base for flavored tea when a maker wants to introduce some more unusual elements into a line. This is because their flavors are mild, and the added flavors can stand out more strongly. Black tea is rich enough that it is actually a great base for flavors, provided you match them well. 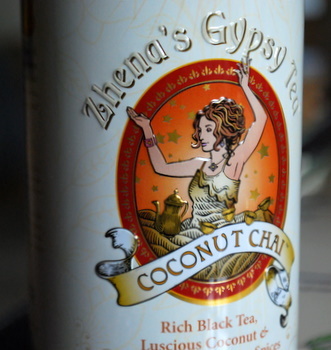 In this case, the combination of coconut and chai tea on a black tea background in Zhena’s Gypsy Coconut Chai is absolutely brilliant. The organic, fair trade tea has a rich and spicy flavor to it, with notes of ginger and cardamom. The coconut flavor is subtle, but clear, and really comes through if you decide to sweeten the tea and not just drink it black. It’s a very balanced tea, with all the flavors playing together in such a way that even those who say “but I don’t like chai tea!” will happily drink a cup of this. If you don’t see this same package in stores, don’t worry. It seems as though the company is moving towards a simpler, all-black label for this tea at the moment.